"Deliveries anywhere in the UK, Ireland or Europe"
Fast, Reliable & Cost Efficient Haulage, Distribution and Warehousing. Established in 1933 Kenyon provide bespoke solutions for Road Haulage, Storage and Distribution. Based in Blackburn, Kenyon comprises Kenyon Road Haulage Ltd and Kenyon Warehousing Ltd. With Head Office standing on a six and a half acre site just minutes from the M65 and further warehousing facilities located conveniently adjacent to the motorway network. Kenyon Road Haulage can offer a wide range of services to suit whatever transportation requirements your company may have. However specialist your requirements, Kenyon Haulage has the ability and resources to facilitate your delivery. Learn more about our Transport Services. Kenyon Warehousing has experienced dramatic growth within the last few years as more and more companies look for third party storage facilities. 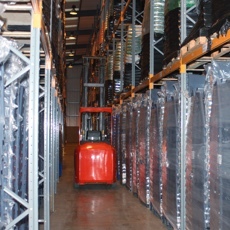 Kenyon warehousing comprises over 200,000 sq ft of warehousing and manages the stocks of a diverse range of customers. Read more about our Warehousing Facilities. Kenyon Road Haulage can tailor our service to meet your total distribution needs, direct from the end of your production line or port of entry to final delivery at your customer’s premises. Learn more about our Distribution Network & Services.